I've been fooling with 12 volt power of late, and seeing how complicated or simple it might be to depend on it. For this, I chose a single task; the powering of my 12 volt cooler. I used a separate 110 amp hour Kirkland (Costco) Deep Cycle battery. 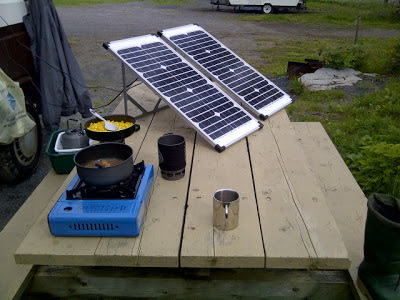 The initial take-home message is that I need much more solar collection ability than I have. Combined, my two 40 watt Coleman solar Panels are simply inadequate. I'm not quite getting 5 amps of charge from them, and that's only in ideal conditions. Thankfully, the cooler is quite efficient. The unit draws a maximum of 46 watts, or about 4 amps. Also, it's only cycled on for less than half the time so I'd estimate about 2 amp hours consumption. Assuming one does not want to run their battery much below half-way, we're looking at the single battery easily powering the cooler for a 24 hour period, but not much more. Of course while driving, the battery can charge back up, but if you want to stay put for a few days, you'll need a solution. 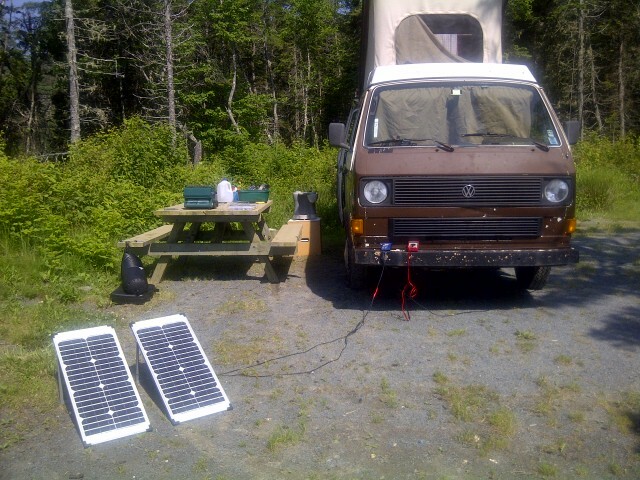 Assuming nice sunshine, my setup can "maybe" put 50 amps back into the battery on a nice long summer day, if I move the panels to better face the sun as the day goes along. So, in reality I can barely keep up. Knowing this, I think I will conclude that 200 watts of solar panel is a working "minimum".